We believe the traditional advice from financial advisors regarding long term care insurance is generally wrong. A standard recommendation is to buy a traditional long term care policy, which creates another expense that increases in cost as you get older. If you need care in your 60’s or 70’s this could be a viable strategy. The benefit you will receive will normally far exceed the cost you pay. But if you are healthy, and plan on living into your 80’s and beyond, this could be very expensive, bad advice. An 87-year old man once came into our office to meet with CEO, Troy Sharpe, after listening to the Retirement Income Show. He slid his policy’s annual premium notice across the table to us. The notice showed he was going to have to pay 100% more this year to keep his policy in force. He had paid for that policy for more than 15 years, had never had a use for it, and ended up unable to pay for the continually rising costs. 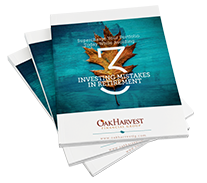 At Oak Harvest, because we focus on helping people in retirement, we’ve seen these notices and this kind of situation numerous times. This is why we recommend using strategies that help offset the cost of long term care in the future without creating additional monthly expenses that can increase in cost over time. Depending on your situation, retirement vision and goals, there are various innovative solutions on the market today that we believe are better solutions. Ensures that your money and benefits can pass to your family if you never need care. Is fully guaranteed against your having to put in more money to maintain coverage. What is the best way for your family to plan for these future costs? The main purpose of any long term care plan should be to offset the burden of large expenses and reduce the need to withdraw from the portfolio to pay for care. At the same time, you may want to make sure a surviving spouse is positioned to have enough money to never run out of income and be able to finance their own care situation without being a burden to children. As part of building a Customized Retirement Plan, our “Retirement Dream Team” will work with you to determine how long term care strategies may be utilized to help protect your wealth, family and legacy.